In 2006, Borrell Fire and in 2009, Suarez Fire joined ORR Protection Systems to become Florida’s premier “Mission Critical Fire Protection Service Providers." 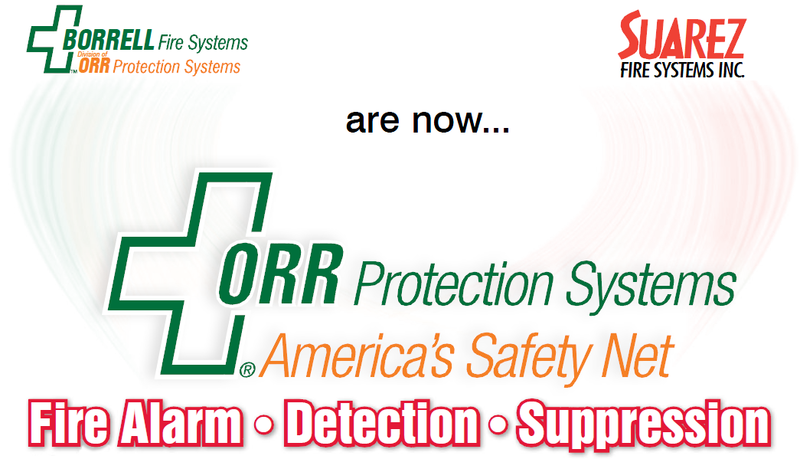 Today we are pleased to announce that both Borrell and Suarez Fire are changing their names to ORR Protection Systems. Even though the Borrell and Suarez Fire names are gone, the local service and support you have experienced since 1973 will only get better. So whatever you may have… fire alarm or suppression systems, ORR is your one-stop-solution for all your service needs. Today ORR services the entire state of Florida, from Miami to Tampa, Orlando to Jacksonville, and Gainesville to Tallahassee. Since 1971, ORR Protection Systems has grown to be the nation’s largest privately owned safety and fire protection company in the country. Some of the largest companies in the world trust ORR to protect their mission critical and high value assets from downtime due to a fire. Today, ORR provides fire protection services nationwide.